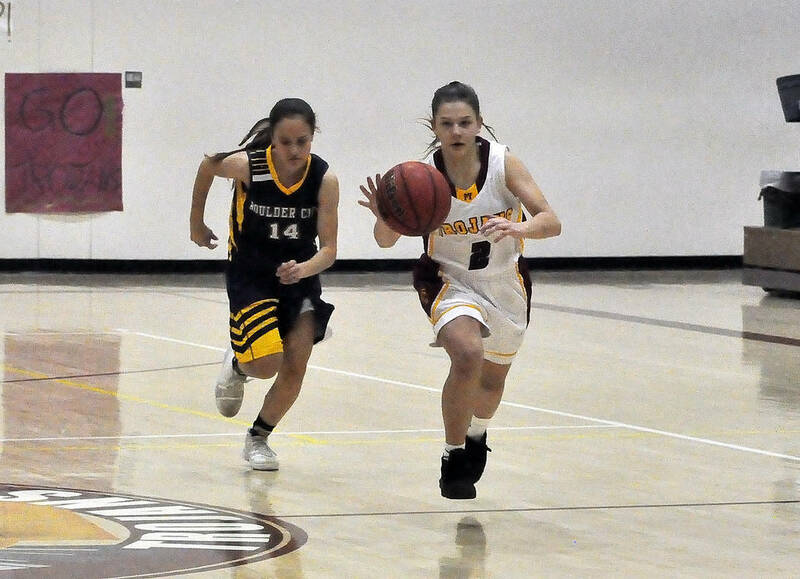 Last Thursday night, the Pahrump Valley High School girls basketball team headed into Las Vegas to play Del Sol and came back with a 43-13 victory. 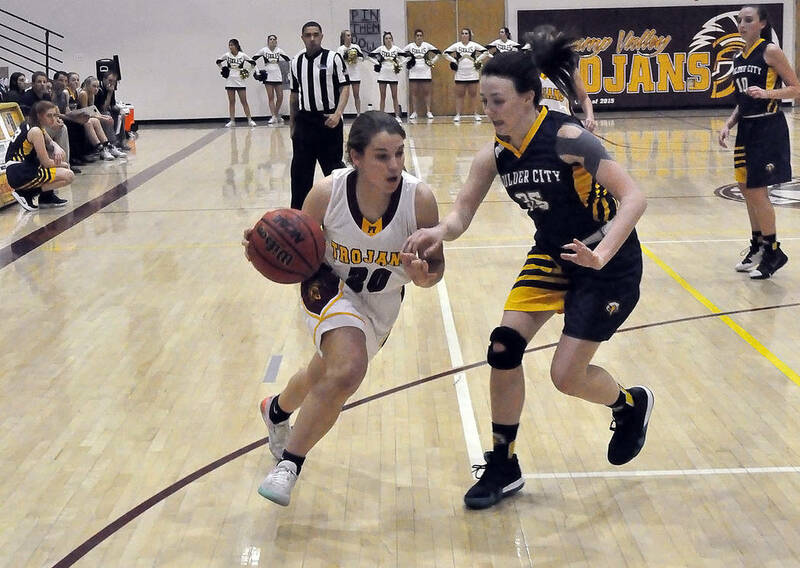 Horace Langford Jr./Pahrump Valley Times Sophomore forward Kate Daffer scored 12 points to lead Pahrump Valley during the Trojans' 31-29 loss to Boulder City on Friday in Pahrump. Horace Langford Jr./Pahrump Valley Times Pahrump Valley sophomore guard Maddy Souza looks to drive past Boulder City's Hannah Estes during Friday night's game in Pahrump. Horace Langford Jr./Pahrump Valley Times Freshman guard Tayla Wombaker runs the floor pursued by Boulder City's Keely Alexander during the Eagles' 31-29 win over the Trojans on Friday night. One night later, the Trojans hosted Boulder City and came up on the short end of a 31-29 score. Guess which effort pleased coach Bob Hopkins more? “I’m happier tonight than I was last night,” the veteran coach said after the loss to Boulder City. The primary reason Hopkins was happier Friday was the way the Trojans put themselves in a hole against the Eagles and then fought their way out of it, trailing 21-6 almost halfway through the third quarter before rallying to tie the game at 29-29 in the final minute. The Trojans came very close to taking the lead with about 20 seconds left as junior forward Kylie Stritenberger saw a shot go in and out of the basket, then was called for a foul going for the rebound. 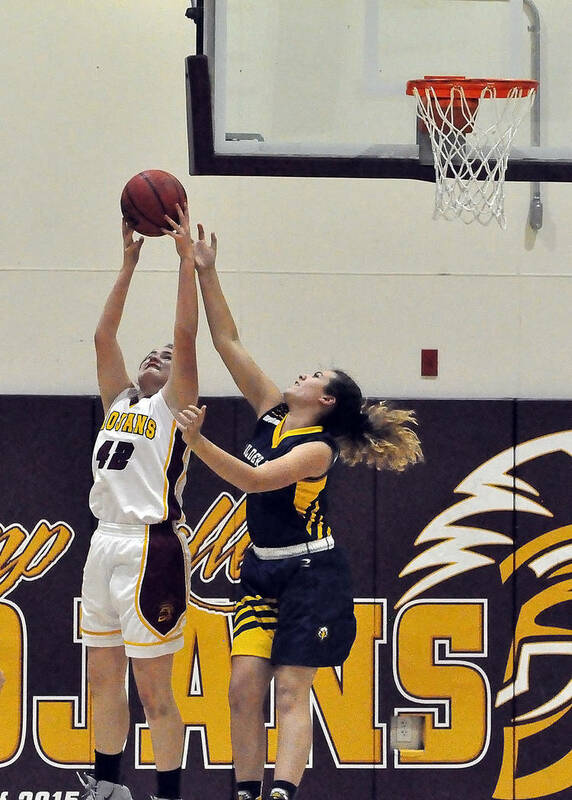 Ellie Howard made both ends of the one-and-one, and a desperation Pahrump Valley shot at the buzzer hit the top of the backboard. On Monday night, Kate Daffer scored 17 points and Sam Runnion tallied 14 as the Trojans rolled to a 66-21 win over Democracy Prep. For a team that plays exceptional defense, the game against Boulder City opened on a sour note for the Trojans. Estes would lead all scorers with 16 points, including four 3-pointers, but those first two shots would match the entire Pahrump Valley offensive output for the first half. The Eagles led 10-4 after the first quarter, and after each team managed just one basket during the second, took a 12-6 lead into halftime. And there’s the rub. The Trojans worked the ball inside quite well and had plenty of good shots, but, again, they just didn’t fall. Then, midway through the third quarter, the inside game started to click. During an eight-minute stretch spanning the third and fourth quarters, sophomore forward Kate Daffer and Stritenberger showed just what the Trojans are capable of when the shots fall. Daffer scored 10 of her 12 points during the stretch, 2 after an offensive rebound by Stritenberger, who added 4 points in a 19-7 run. Jackie Stobbe capped the run with two outside shots, the second a 3-pointer from the corner that made it 28-25. The defense was outstanding during that time, forcing two held balls and making a steal on three consecutive Eagles possessions. “Makayla (Gent), Maddie Souza and Tayla Wombaker played great defense,” Hopkins said. But getting back in the game and winning it are two different things, and the Trojans had some of their same problems crop up down the stretch. During one agonizing sequence, crashing the boards after a missed free throw gave them two more putbacks, but neither found the basket and a foul was called going for a third try. The Trojans only went to the line six times, making their first four shots but missing the front end of a one-and-one twice in the closing minutes. A late Pahrump Valley turnover was negated by yet another held ball forced by the defense, and when Wombaker scored on a layup after a steal with 56 seconds left, the game was tied. How close did they come to taking the lead? “Kylie’s ball was about three-quarters of the way down,” Hopkins said. The best and worst of the Trojans were on display during the game, with great defense and determination almost carrying the day. Beating Del Sol the night before required much less from them. “We didn’t play last night until the fourth quarter,” Hopkins lamented. “We won by 30 last night, but it was 2-2 with six minutes gone in the first quarter. Eventually, what we practiced and practiced on Wednesday night and what we talked about for three quarters, we finally starting doing. So Hopkins took the loss well, figuring the teams likely will meet again in the regional playoffs.